It was Christmas night at the White House and all was calm and bright in readiness for Santa’s visit. 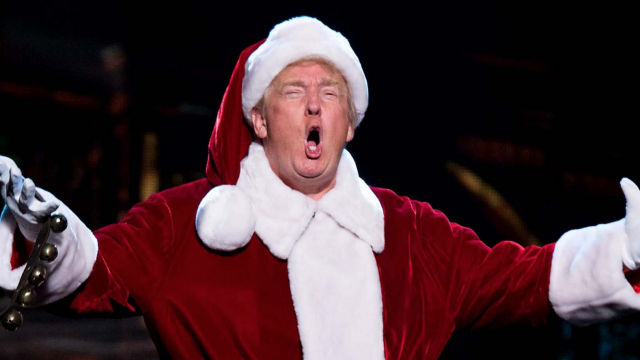 President Scrooge slept soundly secure in the knowledge that his tax cuts were merely a prelude to other seasonal gifts like obliterating Obamacare, building the Wall and terminating terrorist threats caused by immigration. Suddenly there was a blinding flash of light in Scrooge’s bedroom and he awoke to find the Pope standing at the foot of his bed. “I am the Ghost of Christmases Past” announced His Holiness. Without further ado, the Pope grabbed Scrooge by the arm and propelled him to a place where he could witness the Scrooge family household in Queens back in Christmas 1953. There was young Donald aged seven playing joyfully with his Christmas gifts, playing Kiss and Don’t Tell with the girls and shrieking with delight when the Hispanic kids came in from next door. Not ten minutes later another blinding flash of light signalled the arrival of Robert Mueller. “I am the Ghost of Christmases Present,” announced Robert. Robert immediately whisked Scrooge off to a place where he could watch the inside of the Kremlin in real Christmas time. There was no sign whatsoever of Christmas but rather Putin plotting with his advisors to arrange Scrooge’s impeachment and replace him with a sleeper agent who looked just like Mike Pence. Scrooge was visibly shaken but quickly regained his composure. “Bah humbug,” shouted Scrooge as Robert exited stage left. Not five minutes later a Hollywood-style light show announced the arrival of Harvey Weinstein. “I am the Ghost of Christmases Future,” announced Harvey. “What’s that thing round your ankle?” asked Scrooge. “I have come to save you from the same Christmas fate that has befallen me” announced Harvey, and with that he led Scrooge to a place where he could witness Christmas scenes from the future. There was Melania buying Christmas fare with food stamps and Ivanka Scrooge being prosecuted by the Climate Change Court for unauthorised use of electricity for Christmas Lights. “And who’s the guy eating Christmas lunch with you in the slammer?” asked Scrooge. And so it came about that the true Christmas Spirit prevailed once more right across the land and Scrooge became head of the UN Organisation for the Sustainability Of Christmas.